What happens when the soul of Santa Fe meets the spirit of Paris? The inspired, hand-crafted designer handbags of '&e' are born! Behind ‘&e’ label lies the artistry of German-born designer Ande Hambüchen. Ande's soul has been in Santa Fe for decades, while her body honed its design and tailoring skills in Cologne, Barcelona, Paris and New York. Ande spent 17 years in New York City as a fashion journalist, studied at F.I.T. (Fashion Institute of Technology), and worked as a designer for her own label ‘&e’. The rich cultural tapestry of Ande's life strongly influences her work. Perhaps a nod to her German origins, ‘&e’ label designs are always ‘engineered’ to be extremely wearable and practical. 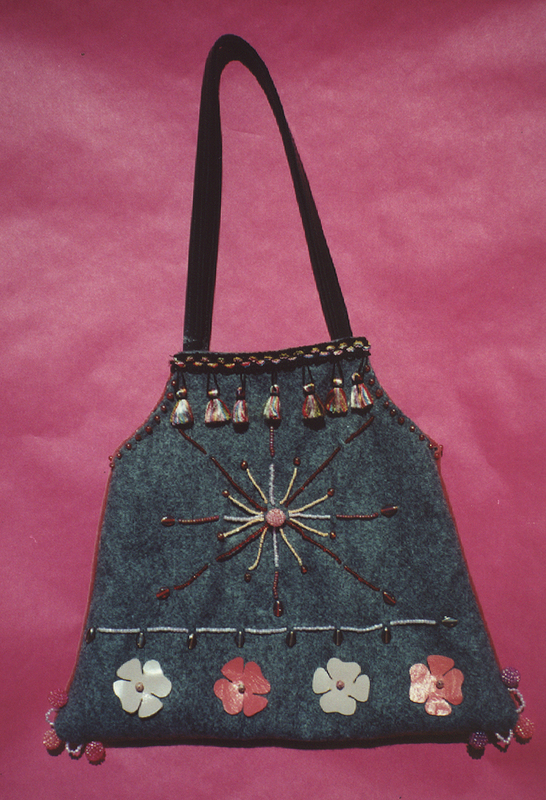 The one-of-a kind and limited edition handbags express the magic of the Southwest and the craftsmanship of Europe. You will also find humor and political statements in ‘&e’ creations. Anyone who calls herself a ‘fashionista’ should always have an outrageous piece in her collection! Who could live without a handbag with red angel wings, a duck shaped handbag, or a Free Tibet-inspired purse? Whether your style is classic or daring, you will find your favorite new design here at the ‘&e’ label. As long as I can remember I have been collecting, and later making handbags. If I can believe my mother, that started at the tender age of three. I would “take” my mom’s girlfriends’ handbags, hide with them under the table, dump all their contents, and play with my amazing new collection of accessories, prizes and jewels. I was also told, (although I do not recall these events), that I would eat all edible items found in these wonderful bags. Of course, word got out, and magically, there began to appear sweets in all the handbags. How can you not LOVE handbags after that? ?